During his turn, Han Dang can compete with any player. 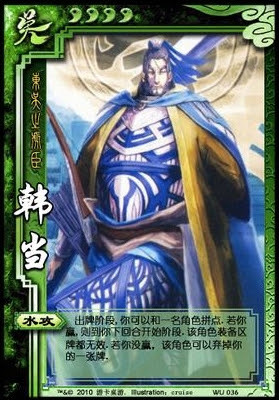 If he wins, the loser's equipment has no effect until the beginning of Han Dang's next turn. If he loses, the other player can discard one of his cards. To show that the equipment is rendered useless it should be turned upside down. This helps players remember that, despite having it, the player can't use it. If this useless equipment is replaced while face down, it is replaced with new face up equipment. This new equipment works just fine and the player can use them. When Han Dang starts his next turn, all equipment should be turned so it is face up. Han Dang can use "Water Attack" more than once per turn. Even if he loses, he can try again with the cards he has left. He can try and ruin as much equipment as he can. When Han Dang loses, the other player gets to choose what card to discard from Han Dang. This can be a hand card or an equipped card.